The winter days are long and the memories of warm summer afternoons seem so distant. Crostata di Marmellata is the ultimate dolce to prepare during the winter months to recall summers past. Freshly picked berries, cherries, peaches, and apricots are no longer available at the market, but flavorful jams reminiscent of the delights of summer certainly are. Some of my wonderfully talented friends shared their special jams of the season this year: olallieberry, strawberry and apricot. What better way to feature these jams than to make them the centerpiece of a lattice topped crostata. Don’t despair if you are not as fortunate as I in the friends who make jam department, there are many high quality jams on the market to choose from. Pick one to treat family, friends, and yourself to the sweet memories of summer…. Pasta frolla recipes are widespread and differ slightly yet all produce a rich and tender crust comparable to a cookie dough. The pastry is made with eggs and/or egg yolks, flour, butter and sugar and is generally prepared for fruit or jam tarts. My instructions, although simple may seem a bit tedious in the way I detail forming the dough. It is intentional – the pastry is fatto a mano or made by hand, because this will render the tenderest of crusts. This basic yet specific handling technique is to insure that the finished pastry remains delicate once baked. An indispensable and inexpensive kitchen tool, the bench scraper will make the preparation a breeze. Please don’t skip refrigerating the dough, as this allows a resting period which makes handling far easier…. Marinara sauce is an essential in any Italian pantry and so easy to make at home. With is recipe you can always have a top quality sauce at hand and never rely on a jar again. The finished sauce largely depends upon the quality of canned tomato one uses. I strictly use peeled San Marzano tomatoes imported from Campania Italy; not San Marzano style. The San Marzano variety has a thicker flesh and fewer seeds than the standard Roma tomato. Authentic San Marzano tomatoes will have a DOP emblem on a the label, identifying them as being genuine as designated by the Italian Government or European Union…. Fresh produce is readily available in Northern California, whether it be from a local farmer’s market or a backyard garden. At Casa Levitt we are blessed to have an herb and vegetable garden along with a variety of fruit trees. Our humble grove includes several orange trees-including a blood orange tree, two fig trees, a Eureka lemon tree, a kumquat tree, two pomegranate trees, and a pomelo tree. Last winter’s cold snap, with several nights yielding below 32°, sadly resulted in the demise of our Buddha’s Hand lemon tree. The one citrus tree I have yet to find a spot for is the Meyer lemon. 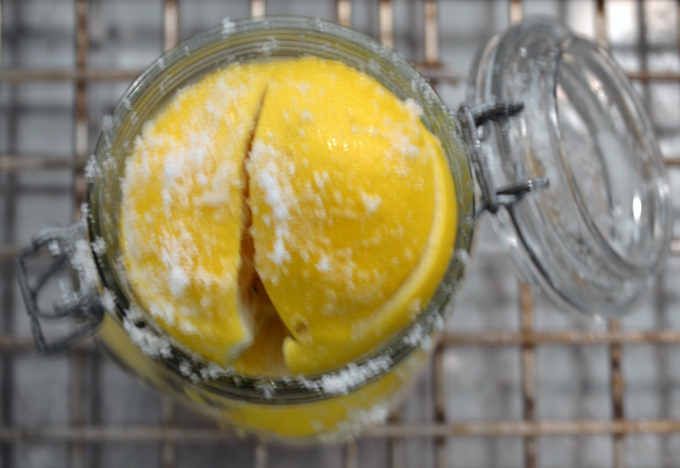 If you aren’t familiar with Meyer lemons, you are missing one of the more exceptional species of citrus fruit. The Meyer lemon is a cross between the classic Eureka lemon and a Mandarin orange. The fruit is slightly rounder in shape with a thinner skin which is deep yellow in color. The flavor is less acidic than that of the Eureka lemon; having a more floral aroma. The Meyer is grown commercially in California, but their delicate nature makes transporting a challenge….